a) Closed the following longs: Sold CPFL Energia (CPL), Citigroup (C), and Walmart (WMT) at profits of 4.92%, 7.21%, and 34.94% respectively. The sales had a combined portfolio impact of 0.86%. 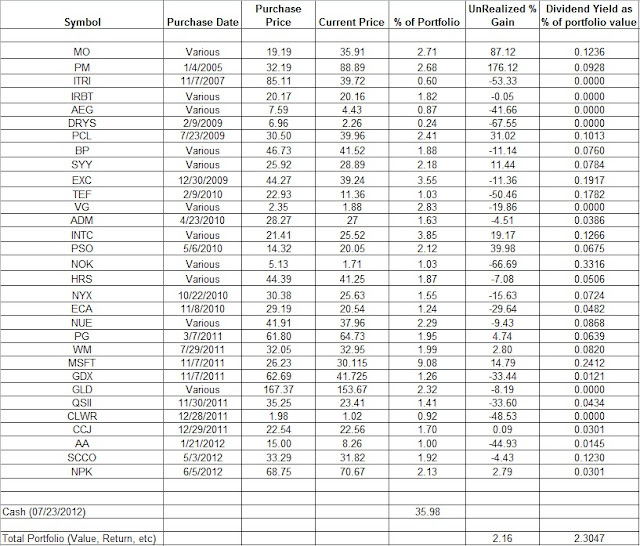 b) Increased/Added the following longs: Added one-third more to our holdings in Nokia (NOK) on 07/19/2012 at $1.82. f) Short Calls: Closed short calls on Quality Systems (Sep 2012 45), Gold Miners ETF (GDX Jan 2013 59), Alcoa (AA Jan 2013 12.5), Nucor (NUE July 2012 43), Intel Corp (Oct 2012 27), and Microsoft (Aug 2012 31) for modest gains for a combined portfolio impact was 0.65%. We also established short calls against our entire Nucor long pong position (NUE Oct 2012 40 @ $1.1). g) Short Puts: Closed short puts on Apple (Sep 2012 550), CVI Energy (CVI Dec 2012 25), and Procter & Gamble (PG Jan 2013 57.5) for modest gains for a combined portfolio impact of 0.27%. 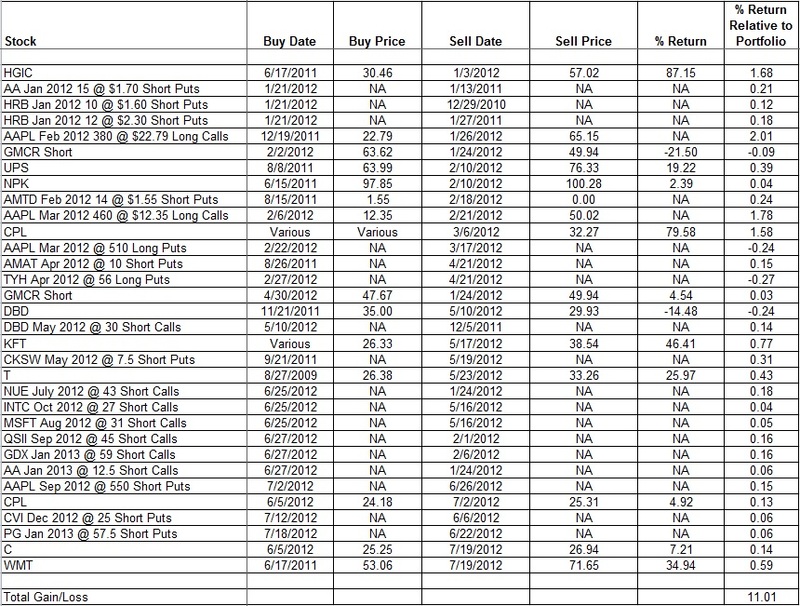 We still have the CVI Energy 25 long calls open. So, the net effect of that transaction was conversion of the synthetic long position to a long call position. 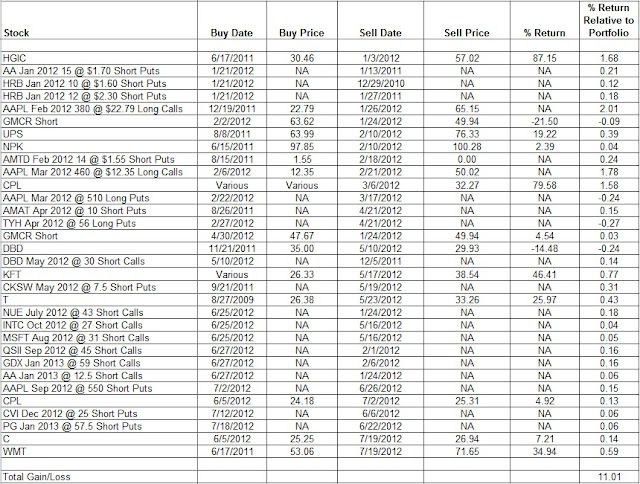 We also established short puts on Apple (Oct 2012 560 @ $22.60) on 7/3/2012 and Nucor (Jan 2013 34 @ $2.20) on 7/12/2012. h) Synthetic Longs: The Corning long calls (Jan 2014 12) were converted to synthetic longs by establishing short puts with the same expiry & strike price. The net cash outlay of the transactions stand at ~0.1% of portfolio. The cash position in our portfolio is at about 36%. The overall portfolio is 4.34% down compared to our cost-basis. 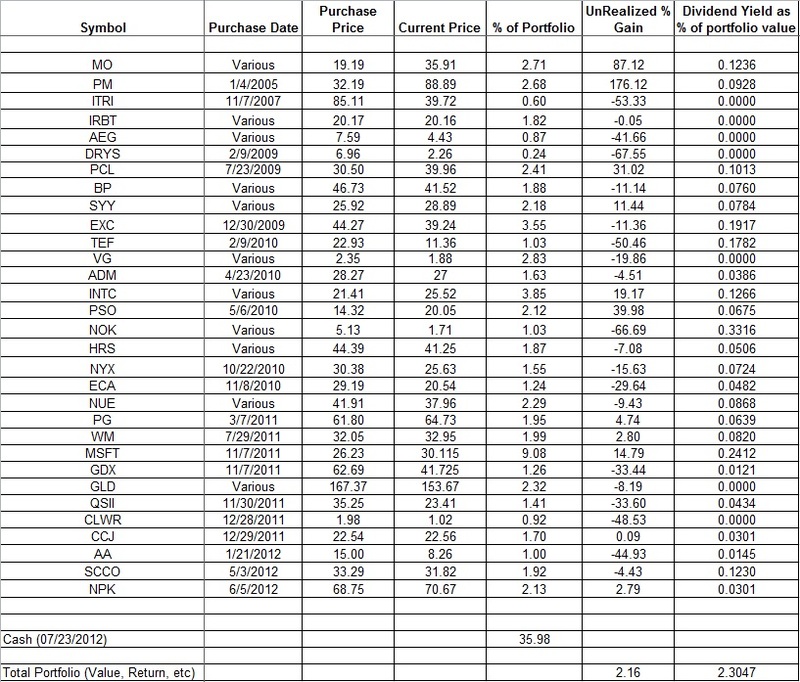 Excluding dividends, we have a realized gain of 11.01% in the portfolio YTD. Short Puts: Apple (AAPL Oct 2012 560 @ 22.60), ABB Ltd (ABB Dec 2012 15 @ 0.65), Quality Systems (QSII Dec 2012 30 @ 2.15), and Nucor (NUE Jan 2013 34 @ 2.20). The short puts together have a cash coverage requirement of about 40.5% of our cash position. Short Calls: Itron (ITRI Aug 2012 40 at $4.20), Alcoa (AA Jan 2013 12.5 at $0.64), Dryships (DRYS Jan 2013 2.5 at $0.65), Clearwire (CLWR Jan 2013 1.5 at 0.35), and Nucor (NUE Oct 2012 40 at $1.10). The short call exposure is ~5% of the portfolio. Long Calls: CVI Energy (CVI Dec 2012 25 @ 2.10). Synthetic Longs: JC Penney (JCP Jan 2014 25) and Corning (GLW Jan 2014 12) with a net exposure of ~4% of portfolio and ~10% of cash. Watch List: Assured Guaranty Limited (AGO), Air Products & Chemicals (APD), Bemis Company (BMS), Canon (CAJ), Dell Inc (DELL), Diageo (DEO), Emerson Electric (EMR), Forest Laboratories (FRX), Gafisa SA (GFA), Bank of Ireland (IRE), Jefferies Group (JEF), McGraw Hill (MHP), 3M Company (MMM), NovaGold (NG), Nestle (NSRGY), PepsiCo (PEP), State Auto Financial (STFC), Teva Pharmaceuticals (TEVA), Vivendi (VIVHY), and Whirlpool (WHR).